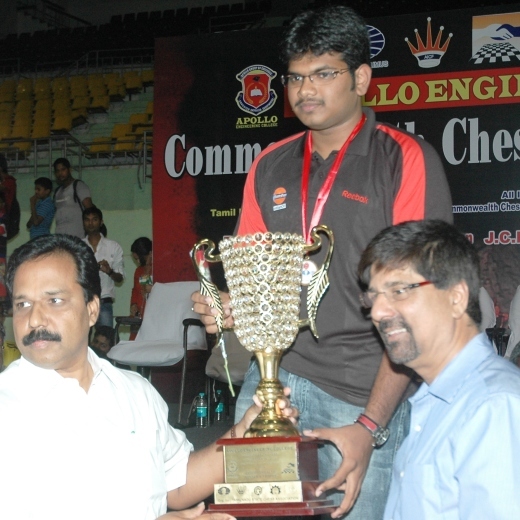 Grandmasters M R Lalith Babu and Sergei Tiviakov scored final round victories reaching top of the table with 9.5 points after the eleventh and final round of the Apollo Engineering College Commonwealth Chess Championships 2012 at Multipurpose Indoor Stadium, Chennai here today. In the crucial final round, the higher seeds Tiviakov and Lalith Babu defeated S L Narayanan and P Karthikeyan respectively. The win took both on top of the table with 9.5 points, with Tiviakov edging out Lalith Babu on the tie-break. 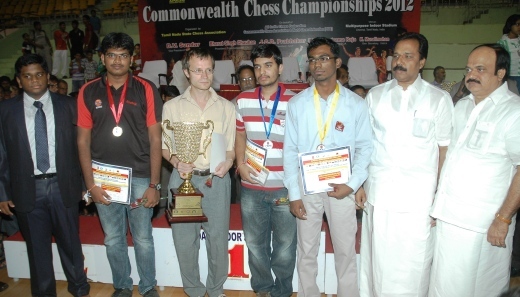 Being the Commonwealth Chess Championships 2012 incorporating the International Open, Tiviakov from The Netherlands, which is not a Commonwealth country, was declared the Open Champion. 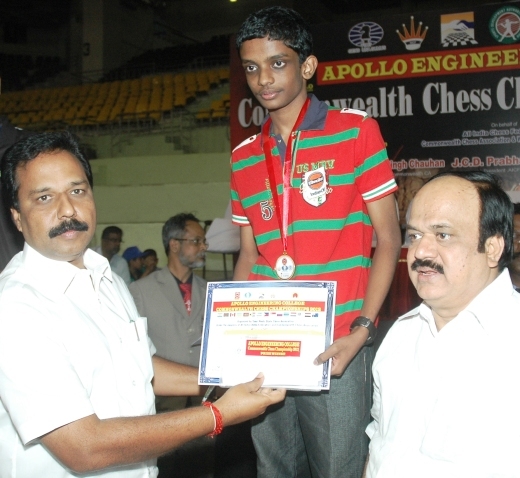 India’s Lalith Babu was awarded the Commonwealth Champion title. Finishing behind Gold medalist Lalith Babu at 9.0 points were Chennai based Shyam Sundar and Sethuraman who scored stunning upset victories over higher rated GMs Ahmed Adly (Egypt) and Marat Dzhumaev (Uzbekistan). The crucial final round win fetched them Commonwealth Silver and Bronze medals. The Gold, silver and bronze medals in the Women’s section went to Sowmya Swaminathan, Nisha Mohota and Mary Ann Gomes respectively. Chennai based Ram S Krishnan of BSNL made it a double delight as he upset GM Oleksienko Mikhailo of Ukraine and added a GM Norm to his 9 game IM Norm made two rounds ago. Giant killer S L Narayanan took home his second International Master Norm despite his defeat in the hands of top seed Grandmaster Sergei Tiviakov. Full standings bellow. Prizes worth Rupees 1,000,000 (approx USD 18,428) were awarded to the prize winners by Thiru N R Sivapathi, Hon’ble Minister for School Education and Sports & Youth Welfare, Law, Courts & Prisons. Delivering his chief guest address Thiru N R Sivapathi elaborated about the multiple welfare and award schemes brought for the development of sports in the state of Tamil Nadu by the Chief Minister. 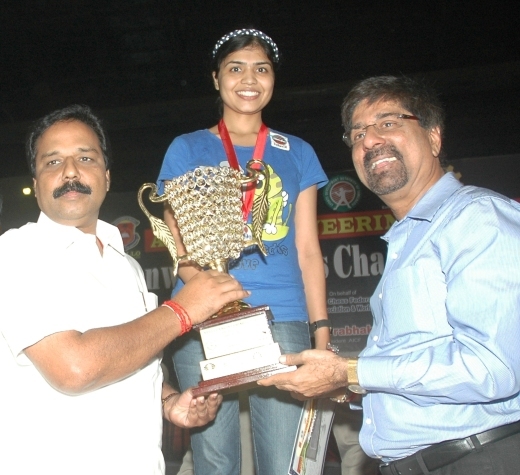 Present in the dais were special guest of honor Thiru Krishnamachari Srikkanth,former Captain, Indian Cricket team, Thiru S Priyadarshan, CEO & Vice Chairman, Apollo Group of Colleges, Thiru JCD Prabhakar, MLA, President, All India Chess Federation, Thiru D V Sundar, Vice President,Thiru S Ganesan, Chairman, Organsing Committee and Thiru K Muralimohan, General Secretary, Tamil Nadu State Chess Association.